Reading progress update: I've listened 1200 out of 4260 minutes. I'm listening a lot this Sunday. It's good company while I clean. I'm up to the last tale now. The Blue Carbuncle made me laugh so hard. I don't remember being so amused by this collection as a child. The sense of ridicule is really something that develops as you get older I guess. “It seems to me that I have done you full justice in the matter,” I remarked with some coldness, for I was repelled by the egotism which I had more than once observed to be a strong factor in my friend’s singular character. 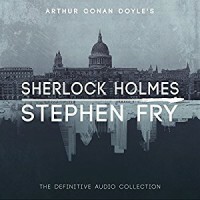 Cute of ACD to tell us Holmes' opinion of Watsn's tales on the last story, and it be this. “Pshaw, my dear fellow, what do the public, the great unobservant public, who could hardly tell a weaver by his tooth or a compositor by his left thumb, care about the finer shades of analysis and deduction! Doubly cute. Bang the wall a little more, won't you, to get us to protest louder.